These VDS wines are obviously my pet projects. It probably does not make economic sense to purchase insanely expensive grapes from vineyards that are producing miniscule yields of one and two tons per acre–and then making wines no one can sell because of my obscure labelings that have no varietal designations (let alone a red and white wine with the same name!). But the blended wines of the southern Rhone fascinate me no end. No, not the cheap ones that you just knock back and forget, but the ones that are serious, captivating, and made with care. They are the inspiration for these wines. 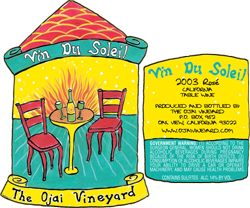 The white is roussanne based and exotically bees-waxy, rich and floral; and the red is grenache based and has that intoxicating raspberry aroma and a wonderful delicacy and finesse despite being a huge and flavorful wine. Both these wines are well crafted (if I say so myself) and delightfully different from the regular old varietals we are used to.